Those wanting to follow the official Camino should pay no attention to the official signs at the beginning of the stage that leads them to Melide, where they say farewell to the Primitive Way and connect to the more popular French Way. Before this walkers will pass at least 15 miniscule centres-the majority without services-through the councils of Guntín, Friol, Palas de Rei, Toques and Melide. They will also have to complete the gentle ascent of Serra do Careón, which separates Lugo and A Coruña. Those wanting to recuperate strength or purchase supplies along this stage are limited in their options: Ponte Ferreira (a private hostel with a café and a rural house that serves full breakfasts) and, As Seixas (a private albergue with vending machines, there are also some street venders and a rural tourist house with a private albergue) and Vilamaior de Abaixo (in Vilamor, Toques, and near to Melide, is Bar Carburo). Pilgrims should abandon San Román da Retorta via the Roman road. The route is well signposted and does not pass through any major points of interest. The Primitive route continues through Vilacarpide towards Pacio, Covela and, along a path to Ponte Ferreira. Here walkers will find Casa da Ponte and the private albergue Ponte Ferreira (in the neighbouring centre of Carballal). In Carballal the two official routes are reunited. 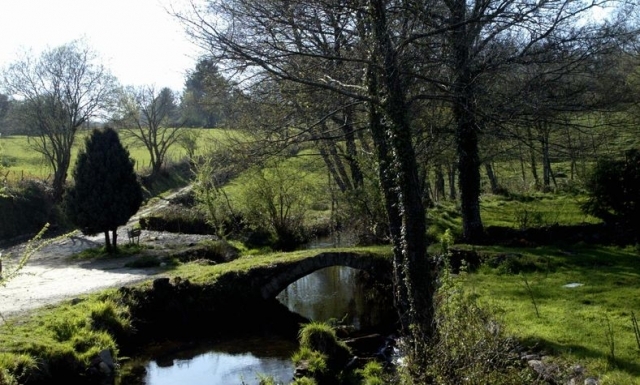 Also there is a medieval bridge, possibly of Roman origin, it should be crossed by the pilgrims. It is one of the most charming sections on the stage and also has a few picnic tables and stone benches for those in need of a rest. After Ponte Ferreira- where a milestone indicates that there remain less than 75 kilometres to Santiago, pilgrims should pass Carballal. In As Seixas there is a splendid public albergue owned by the council, situated one hundred meters from the Camino, it offers 35 bunk beds for hikers, vending machines (for better or for worse, they proliferate the path) they are very well equipped. There are also daily visits from local producers and food venders from the area. The route passes through Serra do Careón, Vilouriz. It is now possible to see Melide from a distance, although there is still a lot of ground to be covered first. Arnade, Vilouriz de Abaixo, Vilamor de Arriba, where there is a fountain, a cross and an out door seating area. After passing this centre it is necessary to walk on asphalt to reach Vilamor de Abaixo. It is no ordinary village. It has a bar, el Carburo (981504907), where it is possible to have a drink or something to eat. The road leads pilgrims to Vilamor and Irago de Arriba (the next location) after crossing the river Furelos via A Ponte da Piedra (a stone bridge). Once this area, which conserves medieval remains and goes through landscapes of great beauty, has been passed, pilgrims reach Melide. The Camino continues on asphalt for three kilometres (CP-4604) towards the capital of this council. The Primitive Way enters the urban centre of Melide via Avenida de Toques and Friol. Pilgrims will find themselves in a town with a strong Jacobean tradition, an enclave where the economy pivots around the Camino. It shows. Here walkers will have at their disposal services, which have not been available so far on the route since Lugo, two stages ago, such as chemists and medical centres. They should go to Rúa Camiño de Ovedo (the traditional name of the Primitive Way). This road will lead them to the junction with Rúa de San Pedro. Only 50 kilometres to Santiago remain. It is the end of the Primitive Way and, here the route joins the French Camino.